It seems that the Pez Factory Easter Egg Hunt this weekend made National News. We were there and we had a fabulous time. We did not experience the melee although it was very crowded. What apparently did ensue is a result of overzealous parents who do not follow directions and feel overly entitled. Here is the setup. In the field outside the factory, three section were cordoned off. One with a sign for kids from 9-12, one for kids 5-8 and one for 4 and under. The website had indicated that there would be a staggered start time for the 3 hunts. The youngest group would start at 10:30 and then each age group was staggered by half an hour. They had the Easter bunny at the Visitor's Center with whom you could take a photo and get a free candy dispenser. You had to pay regular admission to enter the center which was only $5 for adults and $4 for kids 3 and up. We arrived at the location at about 10:15 and found a spot along the edge of our assigned field, the 4 and under area. Prior to the start, a Pez employee informed us that the turn out was far greater than expected and so if anyone didn't get an egg, they would have candy in front of the lobby that they could get. At 10:30 the hunt started. T had his eyes set on a green egg, his favorite color. Once he got it he totally stopped searching for eggs. Even with that he was able to get 4 eggs for himself. We then took a few pics of T with his eggs and then headed to the Visitor's Center. As we were well aware that the other fields were for older kids based on the signs and the website we didn't see any reason to stick around. Apparently, this is when the melee ensued on the field. We missed it, happily. My son was perfectly content with his 4 eggs. He picked them all himself. We didn't experience any pushing or shoving by kids or parents. We actually had a good time. Upon heading to the Visitor's Center there was a healthy line. This was a combination of people looking to get the candy if they didn't get eggs or if they didn't feel like they got enough and those wishing to enter the Visitor's Center. We got on line which moved pretty well and entered the center. It was definitely crowded, but not overwhelming. 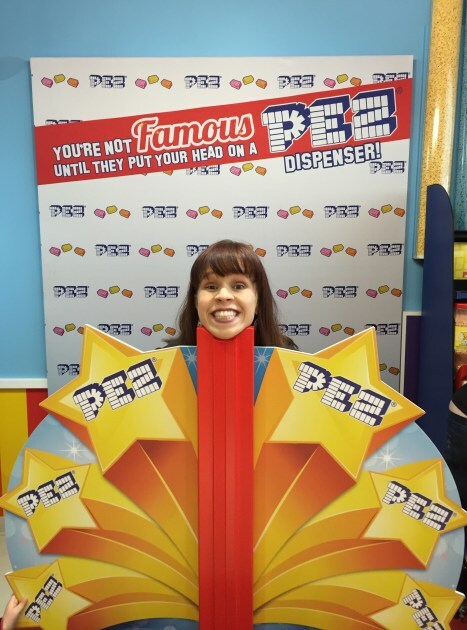 We browsed all the old dispensers on display, we did the Pez Scavenger hunt and we got to take pictures with our head as a Pez dispenser. 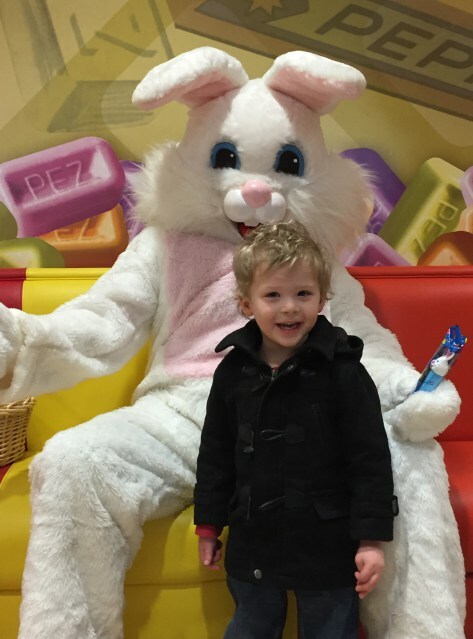 Once we were satisfied, we headed to the second level and got on a shot line for a photo opp with the Easter bunny. The line moved well, and yet no one was rushed to take a picture and move on. 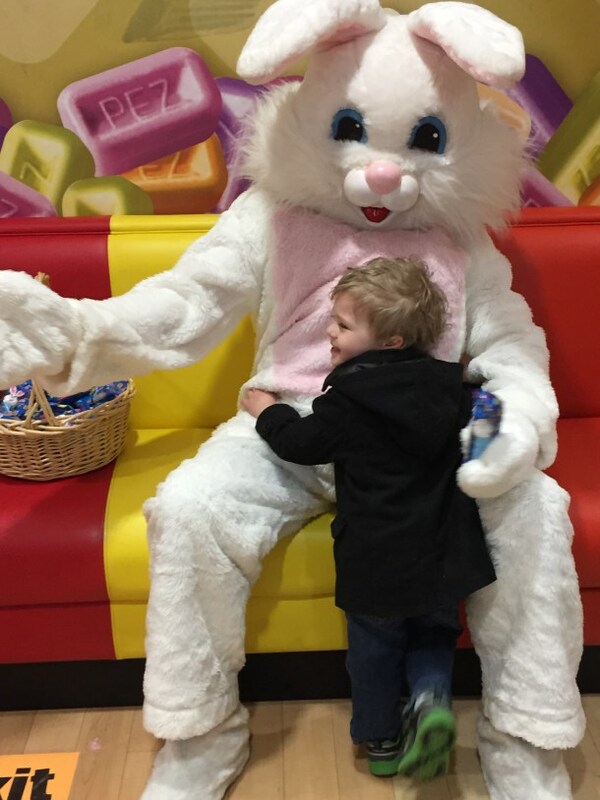 T got to hug the bunny which was actually pretty cute and got a few photos as well as a free Easter bunny dispenser. We then headed to the checkout line with a few dispensers from the gift shop. This line was probably the longest and slowest, but not terrible. The staff was kind and courteous and all in all we had a great time. We didn't experience any of the unpleasantness. While we have every intention of returning when there is less of a crowd, we had a great time and were very appreciative of Pez for putting on this event for the community. I was not even aware of the melee that occurred until someone commented on pictures I posted from the event and mentioned it. I feel bad for Pez for having to deal with some of the parents that apparently took matters into their own hands and did not follow directions. 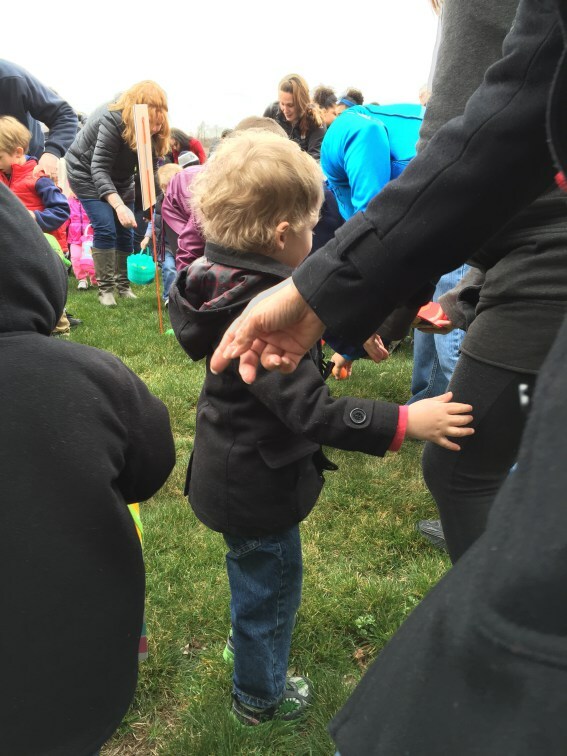 I especially feel bad for any older kids who came at their assigned time only to find all the eggs had been taken. It truly was a situation of a few bad eggs (pun intended) ruining it for the bunch. Hope you had a fun Easter Weekend!! Last week Tyler and I created a cute little Easter bunny project with some basic craft supplies. While there was some controversy over whether a bow tie is an article of clothing or a food item (bow tie pasta), we really enjoyed the project overall. This was another quick and fun project that we were able to do in the time between Hailey going to bed and Tyler's bedtime.